One size: Can fit women’s shoe sizes of 6 through 10 due to the stretchy nature of the elastic in the yarn. For larger women’s sizes and men’s sizing, click HERE. I don’t like to wear shoes around the house but when the temperature drops, I like to wear little store-bought ankle booties. I’ve always wanted to make myself a pair. This design is not intended to be for true ankle socks that you would wear in shoes. They are intended to be little “house booties” to keep your feet warm. 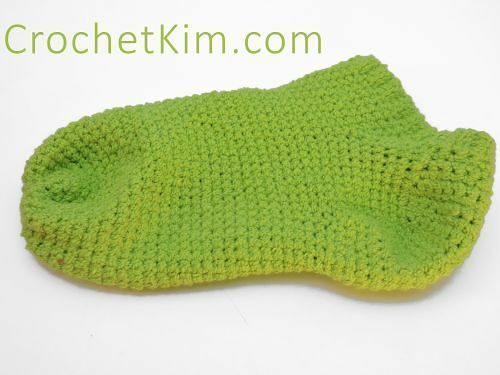 This sock is pretty easy for me to stitch together, but in the world of crochet skill levels, all socks are considered to be at least intermediate level. The project begins by working the ribbing vertically, the heel and the rest of the foot are made along the sides of the rows of ribbing. Please be patient, especially if you have never made a sock before. It will look very strange at first. Use care not to stretch the yarn as you are crocheting with it. You want to let the elastic work for you when you’re wearing it, not stretch it out. This project has not yet been tested with non-elastic yarn. Row 1: With smaller hook, ch 5, sc in 2nd ch from hook and each rem ch, turn-4 sc. Row 2: Ch 1, working in back loops only, sc across, turn-4 sc. Rows 3-47: Rep row 2. Do not fasten off. Without twisting, using initial strand of yarn from foundation chain, seam row 1 to row 47. Begin working along sides of rows. Row 1: With larger hook for this row and throughout remainder, ch 1, sc in side of 8 rows of Ribbing, turn, leaving rem rows unworked-8 sc. Row 2: Ch 1, sc in each sc, turn-8 sc. Row 3: Ch 1, 2 sc in first sc, sc to last sc, 2 sc in last sc, turn-10 sc. Rows 4-6: Rep row 3. On final row, 16 sc. Rows 7-9: Ch 1, sc across, turn-16 sc. Row 10: Ch 1, sk first sc, sc to last 2 sc, sk sc, sc in last sc-14 sc. Round 1: Ch 1, sc in side of 10 rows of Heel, sc in side of 39 remaining rows of Ribbing, sc in side of 10 rows on opposite side of Heel, sc in center 12 sc at bottom of Heel. Mark last stitch with stitch marker. (Move stitch marker up as work progresses in subsequent rows.) Begin working in a spiral without joining rounds throughout-71 sc. Round 2: Sc in 10 sc, sk sc, sc in 37 sc, sk sc, sc in 22 sc-69 sc. Round 3: Sc in 10 sc, sk sc, sc in 35 sc, sk sc, sc in 22 sc-67 sc. Round 4: Sc in 10 sc, sk sc, sc in 33 sc, sk sc, sc in 22 sc-65 sc. Round 5: Sc in 10 sc, sk sc, sc in 31 sc, sk sc, sc in 22 sc-63 sc. Round 6: Sc in 10 sc, sk sc, sc in 29 sc, sk sc, sc in 22 sc-61 sc. Round 7: Sc in 10 sc, sk sc, sc in 27 sc, sk sc, sc in 22 sc-59 sc. Round 8: Sc in 10 sc, sk sc, sc in 25 sc, sk sc, sc in 22 sc-57 sc. Round 9: Sc in 10 sc, sk sc, sc in 23 sc, sk sc, sc in 22 sc-55 sc. Round 10: Sc in 10 sc, sk sc, sc in 21 sc, sk sc, sc in 22 sc-53 sc. Round 1: Sc in 41 sc, sk sc, sc in 10 sc, sk sc-51 sc. Round 3: Sc in 41 sc, sk sc, sc in 6 sc, sk sc-47 sc. Round 4: Sc in 41 sc, sk sc, sc in 4 sc, sk sc-45 sc. Rounds 1-22: Sc around-45 sc. Round 23: [Sk sc, sc in next sc] 22 times, sc in last sc-23 sc. Round 24: [Sk sc, sc in next sc] 11 times, sc in last sc-12 sc. Flatten sock to determine center and, with yarn needle, seam toe. Weave in all ends securely.